← Walsall Wood FC away to Stafford Town this afternoon! The Chemical, or in the time pictured, Superalloys works. Picture taken from The Aviation Forum, as posted by user Wildcat on the 21st February 2006. I’ve been asked the question by reader Norman Taylor as to what I know about Brownhills Chemical Works – otherwise known as The Chemical or The Chemy, later the site of a notorious war scrapyard local kids were all attracted to. The Chemical, for those who don’t know, was situated high on the Lichfield Road, Brownhills, next to the canal, just where the new Castings warehouse is today. The Chemical, or latterly Superalloys, was located where the lrge Castings warehouse is now. Imagery from Apple Maps. The simple answer is that I don’t know much, but local historian Gerald Reece came to my rescue with his book ‘Brownhills A Walk Into History’, in which he features the following passage. Brownhills Chemical Works opened in 1870. In its early days it was a chemical plant producing acids and other coal based derivatives. It took some of its raw material from the Gasworks in High Street. The Chemical Plant took on many guises during its lifetime. 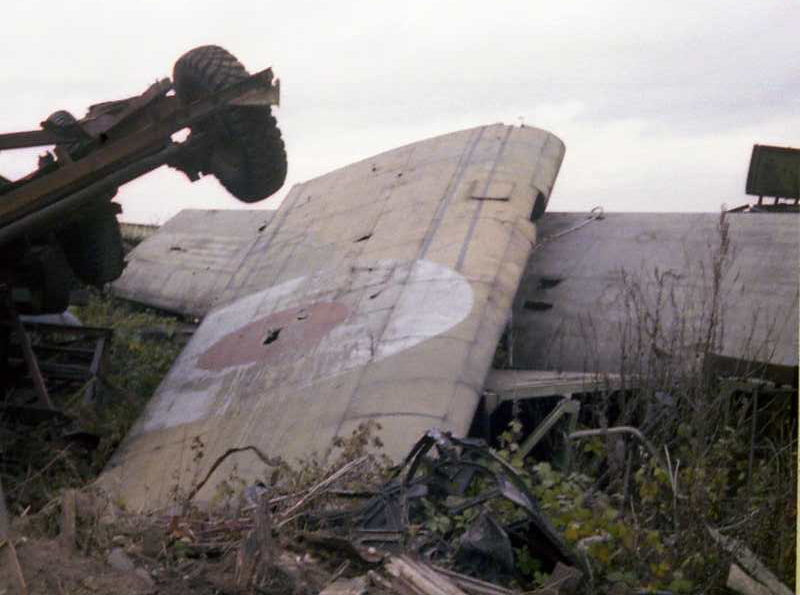 One of its functions during and after the 1939-45 war was to recycle the scrap alloys from crashed aircraft. Brownhills Smelters was formed on 2nd December 1947. They were superseded by Super Alloys. When this Company went out of business the buildings were allowed to fall into an unsightly and unsafe condition. The Chimney, ‘The Chemi Stack’, a landmark for 120 years was felled in 1987. The demolition was carried out by Colin Jones of Porthmadog. The Superalloys chimney was demolished in 1987, but do you know who pushed the plunger? These images are from Gerald Reece’s book ‘Brownhills a Walk into History’ but another set are on display in Brownhills Community Centre. Now somewhere else (and I can’t for the life of me think where) it’s been stated that the famous chimney at the factory, pictured above beeing blown up, had the charge detonated by someone local who entered a competition to do it. Who was it? Possibly a local child? Gerald has also asserted that a number of souvenir hand bells – which are surprisingly common – were cast out of metal recovered by Superalloys and sold as mementoes. You can read about that here. Gerald Reece believes this bell was cast from metal recovered possibly by Superalloys in Brownhills. Local historian Clive Roberts stated in his book ‘Snippets of History in and around Brownhills’ that for a while, before the war, the factory produced tar and the like, which would tie in with the gas works; but I’m also under the impression that Brawns of Home Farm Sandhills had something to do with the factory in the early days. Obviously, I’m interested in anything you have to add here. You can comment on this post or email me – BrownhillsBob at Googlemail dot com. Thanks to Norman for a great inquiry. I spent many hours ‘browsing’ around the Super Alloys yard in the mid/late 60’s. What a treasure trove, if only I had realised exactly what I was playing with. Entry as Matt said was from the rear ( I went in round the back of the ‘egg factory’). A couple of menacing dogs kept most away, but for reasons unknown they were always friendly to me and little brother. I remember seeing a few cockpits/fuselages as well as Anson Mainplanes and a large white fuselage under a canopy. Nuff of the memory lane waffling, hears a couple of pics from the front of the yard. The condition of the Javelins is remarkably tidy ( doubt they had been there long) What price those fuselages today!! 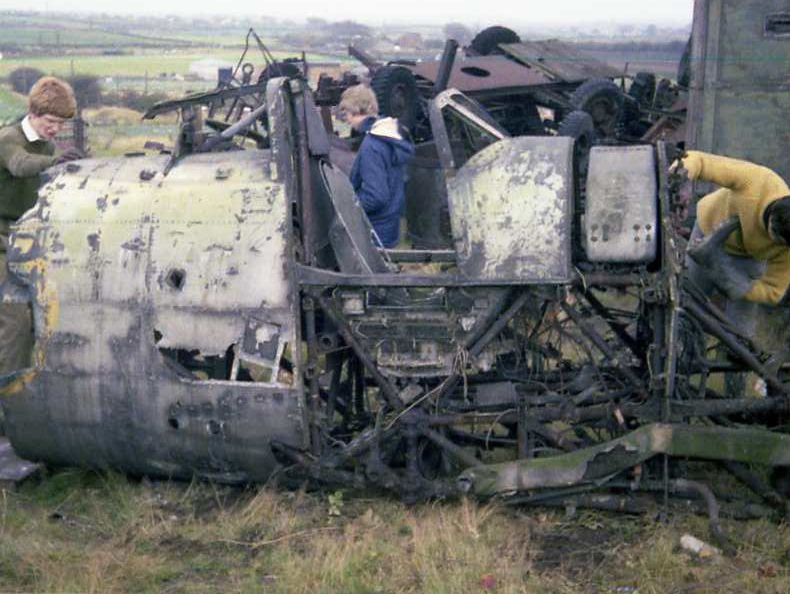 Listed as ‘Brownhills Scrapyard 1977-York wings’ Photo taken from the Flickr photostream of user Bobdcuk. Browse Bobdcuk’s Flickr stream, where I found the 1977 images. 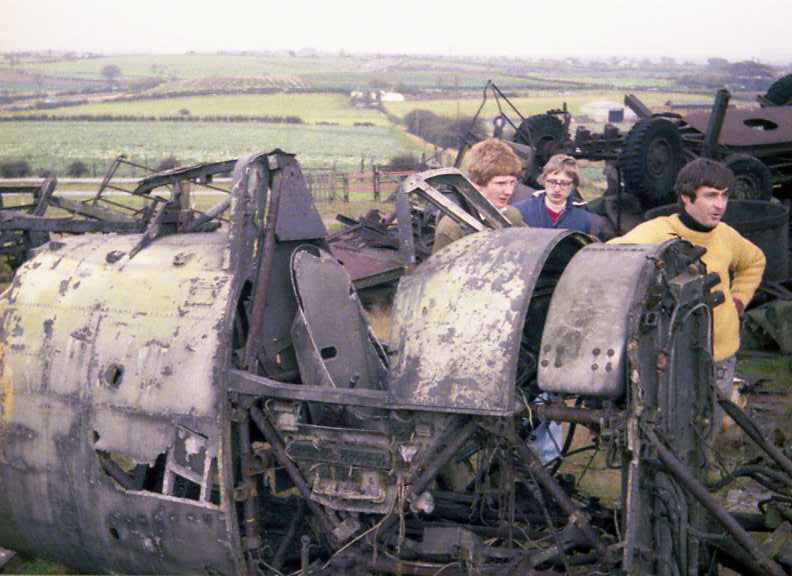 Listed as ‘Brownhills scrapyard 1977 – Typhoon’ – the remembered military vehicle scrap is piled in the background, and also note the familiar view to the rear. Beneath the soil in the middle distance lies the Staffordshire Hoard, as yet undiscovered. Photo taken from the Flickr photostream of user Bobdcuk. Listed as ‘Brownhills Scrapyard 1977 Typhoon’ – notice the welly being used as a glove, times were hard then… Photo taken from the Flickr photostream of user Bobdcuk. This entry was posted in Brownhills stuff, Followups, Interesting photos, Local History, News, Reader enquiries, Shared media, Shared memories, Spotted whilst browsing the web and tagged Bobdcuk, Brownhills, Brownhills local history, Brownhills Scrapyard, Canal, Cheap tat, Derelict, foundry, Local History, New Photos, Staffordshire, Super Alloys, Superalloys, typhoon, Vandalism, war scrap, Wildcat, york wings. Bookmark the permalink. 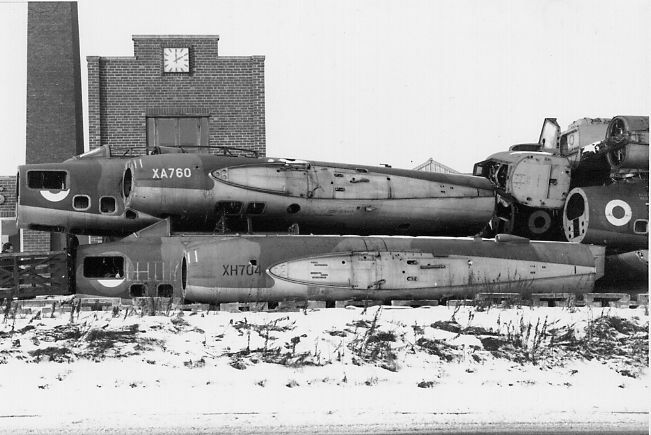 XA760 in the first image is a Gloster Javelin FAW4 delivery date 20/02/1957, s.o.c. (Signed off charge or deemed unwanted by the RAF) 10/05/1962 as CAT 5C (Beyond economical repair or surplus, but salvage of components or spare parts is possible.) at No.71 Maintenance Unit Bicester and scrapped. They would dismantle it to the main parts (fuselage/wings/engines) and sell them by the tonne. Regular supplies of tar were bought by the council during these years. The pictured Typhoon could still exist. Planes in that state tend to be passed on, accumulated with other airframes and added to or taken away from over the years so I have not found a clear answer to its identity or location! I can remember in the early 60s when the Chem had a load of WW2 anti-aircraft floodlights in the yard near the canal and the fun we had as kids throwing stones over to try & break the mirrors. I can remember the Javelins and also meteors due for the melt.